The Lewis Carroll characters are some of the most iconic, unique, and memorable in all of children's literature. Carroll is best known for authoring Alice in Wonderland and Through the Looking-Glass, which are often bundled together as a chapter book for middle-grade readers. Some of Carroll's other famous characters come from his nonsense poem, "Jabberwocky" and "The Walrus and the Carpenter," both of which are part of Through the Looking-Glass. He is also the author of the poems "Hunting of the Snark" and "Phantasmagoria," the dialog, "What the Tortoise Said to Achilles," and the two-part novel Sylvie and Bruno and Sylvie and Bruno Concluded. Alice and her Wonderland compatriots may be Lewis Carroll's most famous and best-loved characters, but there are a myriad of other colorful personalities that Carroll invented through his other writings, ranging from an exotic bird to a couple of fairies. Alice - Alice is the title character of Alice in Wonderland. She's a small British girl who follows the White Rabbit down a hole and finds herself in Wonderland. As she goes through the story and tries to get home, she ends up traveling deeper and deeper into the world and meeting a variety of odd characters. Alice is fairly logical and at first questions much of what she sees in Wonderland, although she does not seem to be afraid or alarmed. 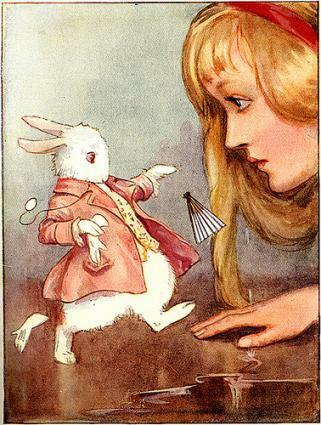 White Rabbit - The White Rabbit leads Alice down the hole that ends up in Wonderland. At the beginning of the story, he continually mutters about being late as he rushes about to find the hole. The rabbit works for the King and Queen of Hearts. Mad Hatter - Alice encounters the Mad Hatter deep in Wonderland, where he is having tea with the March Hare. The Mad Hatter is believed to be insane and acts quite nonsensical throughout his appearances in the book. March Hare - The March Hare is an acquaintance of the Mad Hatter and is present at his tea party in Alice in Wonderland. Cheshire Cat - The Cheshire Cat appears from time to time in the novel, and gives Alice cryptic clues to guide her travels through Wonderland. 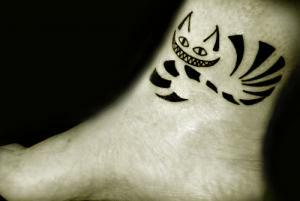 The cat's grin is one of the most iconic symbols from the book. King and Queen of Hearts - The King and Queen of Hearts run Wonderland and display very little compassion for their subjects. The Queen in particular is fond of beheading anyone who crosses her path. Tweedledee and Tweedledum - Thought to be twins, Tweedledee and Tweedledum are young characters that Alice encounters in Through the Looking-Glass. Red King and Red Queen - The Red King and Red King fit the setting of the large chess board in the book and act as chess pieces. They wield some of the most power in the novel and have influence over other characters. White King and White Queen - The White King and White Queen are also powerful chess pieces in the story; the White Queen lives through the title looking glass and is somewhat reversed in time. Jabberwock - The Jabberwock is the primary antagonist in the poem "Jabberwocky" from Through the Looking-Glass. It's supposed to be a vicious monster with sharp jaws; the hero of the poem slays it in the end. Jubjub bird - Not much description is provided for the Jubjub bird in "Jabberwocky," but readers can infer that it's a tropical bird that poses some danger. Bandersnatch - The Bandersnatch is described as "frumious" in "Jabberwocky" and is assumed to be another monster, though less threatening than the Jabberwock. Crew - The crew appears in Carroll's poem "The Hunting of the Snark" and goes in search of the monster. They include a bellman, barrister, bonnet-maker, broker, banker, billiard-marker, baker, butcher, boots, and beaver. The Snark - The Snark is thought to be a sea monster and is also described as a "Boojum," which may be a particularly dangerous breed of creature. Sylvie and Bruno are other prominent Lewis Carroll characters. They are young fairy siblings that encounter a London historian, who serves as the narrator for both Sylvie and Bruno novels. Young readers might also recognize the Walrus and the Carpenter, who appear in Through the Looking-Glass and some animated versions of Carroll's story. Quite a few secondary characters also appear in Wonderland and in Carroll's other works; to learn more about all of them, check out his books and poems from a local library.